Even earthquakes couldn’t shake the path to empowerment. The power bestowed on the women of Nepal through Joint Land Ownership programme not only empowered women but it also helped them rebuild their lives from rubble as well. When massive earthquake hit major parts of Nepal in the year 2015, the world gaped in shock as what remained of Nepal was death and devastation. Standing at the brink of total destruction, it is the will-power of the Nepalese people and the active support from the government as well as local and international NGOs that helped rebuild lives and living. Communities from all over the world lent their helping hand, of which ILC members too were some of the strong supporters. Bit by bit, the Nepalese people regained their footing and helped themselves to self-sufficiency. But what stood out was the massive role that women played in helping their families become financially and socially strong once again. And all thanks to the Joint Land Ownership system that helped the women in the process. The stories of Konu Kumari Karki and Som Maya Bhandari are examples of how Joint Land Ownership has provided successful case studies for the world over to follow. ” JOINT LAND OWNERSHIP IS THE ANSWER TO GENDER DISCRIMINATION” : Konu Kumari Karki proudly displays her Joint Land Ownership document. Farmers of Helambu rural municipality ward 7; Ichok had horrendous sufferings from quake. For many like Konu, the transitional shelter was for living. But their production was still rotting in open air. Rodents and reptiles added to the challenge. After two and half years in transitional shelter, the government announced grant of Rs. 3lakhs. That would be for a two-room house. However for Konu’s family two rooms were not enough. But for bigger house they did not have savings. So, while their neighbors started construction from government grant, Konu’s family decided to choose the alternative and go for HELVETAS as they had their own technicians and mobilizers. This decision proved to be a life changing one for Konu, as she not only got a house but her rightful ownership as well. Like Komu, Joint Land Ownership has been a life changing experience for Som Maya Bhandari as well. Som Maya Bhandari belongs to Helambu Rural Municipality, Ward No 2, Kiul. She is a stereo typical example of women being a mere object of patriarchal society. 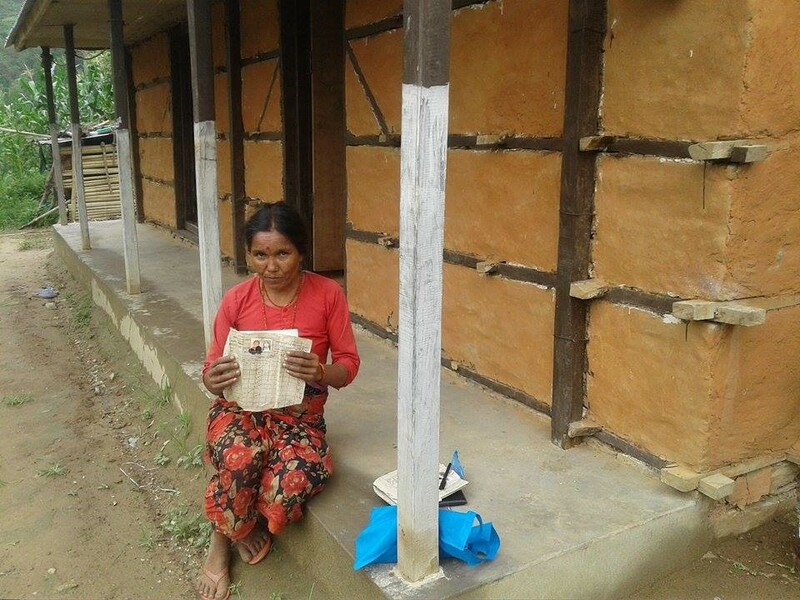 She and her family of 5 were amply affected by the quake. As a result of the quake, her mother in law had deceased and they had lost their property in the disaster.To add to her woes, her husband was an alcoholic. Hence all the family’s responsibility came on the shoulders of Som Maya. Quake had affected their income as well.Trouble was increasing in alarming rate. Regular altercations at home resulted in her children skipping school on regular basis. She was harassed as well. Som Maya adds, “If it wasn’t for my children I would long left the house, but for my children’s better future I endured all the traumas for this long”. Family problems piled up in an uncontrollable manner. Livestock rearing was an only option for livelihood. She had cognizance of it not being enough. Whatever little income she would get as a process would be captured by her husband.Domestic violence became a regular norm.Some turned towards violence as well. In the meanwhile government announced 3 lakh grants for housing reconstruction. Dilemma on this grant being enough or not for housing reconstruction always encompassed Som Maya. Beneficiary card issued by government was in husband’s name. In this period Helvetas announced support for reconstruction of houses. Fortunately their ward was selected for support. Luck was on their side this time as their family was chosen for support. Emotional strain regarding reconstruction was uplifted. For all her troubles in all these years, Som Maya experienced relief for the first time as not only house, she got hold of her precious ownership rights as well. For a change, she could be in control of her land and hence the financial status of the family as well. CSRC, a member of ILC and a vital part of the Commitment Based Initiative on Women’s Land Rights of ILC , has been a part of the life-changing policy of Joint Land ownership in Nepal. Not only were they part of the initiation process but have been regularly building sensitization and awareness around the process and system as well. Their door to door coverage and campaign have ensured that women like Komu Kumari Karki or Som Maya Pradhan can become faces of the global process of empowerment of women. They are also examples to prove that land ownership is a strong tool to bring about social changes which is gender inclusive.